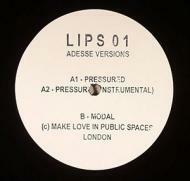 Adesse Versions - Ghost Dub E.P. Make Love In Public Spaces is a new but not so mysterious offshoot of a label which will be familiar to anyone who has been to a certain erotically charged discotheque with a big heart in East London over the last 4 years. They launch with a three track release from Adesse Versions that recasts underground 90s classics of some vintage in his own inimitable style. Adesse Versions is the anonymous alias of a techno producer with previous work for Ostgut Ton and Curle, showing his house side and who you will no doubt recognise from his most recent work Trus'me's Prime Numbers label as Adesse.